How Good a Coach Is Mike Woodson, Really? The Knicks have benefited in recent weeks from a career-best performance from Carmelo Anthony, splendid defense from Tyson Chandler and Iman Shumpert, and a general positive mojo the team has spent most of the season trying to find. But the real breakthrough over the last 25 games — and, of course, the guy who very well might be responsible for all three of those previous factors — has been interim coach Mike Woodson. The Knicks were 18-24 when he took over; they are 16-6 since. The Knicks have salvaged their season thanks to Woodson, and the coach is understandably receiving considerable credit. But Woodson wasn't just invented, dropped from the sky: He is only a Knicks employee because the Atlanta Hawks fired him after six seasons in 2010. We thought it would be instructive to talk to a Hawks fan about what Knicks fans don't know about Woodson, so we asked the smartest one we know: SLAM Magazine writer Lang Whitaker, a terrific basketball writer, the author of In the Time of Bobby Cox, and a lifelong Hawks fan. 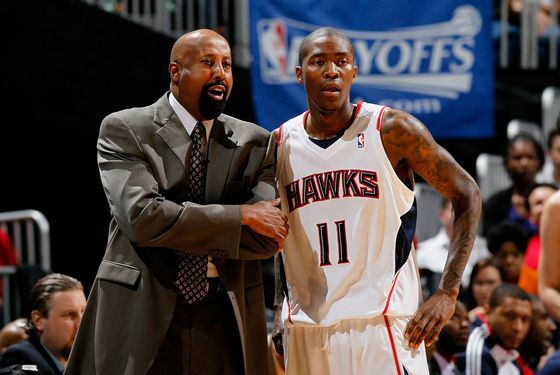 Before we start, one thing occurred to me that might be helpful: A few years ago, Woody let me embed with the Hawks for a road trip for a SLAM story, and he let me sit in for pregame and shootaround speeches. I felt like I learned more about him in the 48 hours of that trip than I did in the rest of the six seasons he was coach. Thank you. We should have known that. So, here in New York, Woodson is considered a bit of a savior, the one guy who figured out the puzzle of Carmelo and the defense and everything else. But in Atlanta, it seems he's not nearly as well thought of. Is that right? If so, why? I’m not sure if it’s fair to say Hawks fans don’t think well of Woody. What he accomplished in Atlanta was remarkable considering the state of the franchise when he arrived — check out his win totals (13, 26, 30, 37, 47, 53) — and I think there will always be some level of appreciation from the fans. By the time he left, I think it was clear to everyone that if the Hawks weren’t going to spend big to make any more roster upgrades, they were going to have to improve from within, and after six seasons, head coach was the easiest spot to make a significant change and much cheaper than if they turned over the roster. Is it possible that Woodson is some sort of Superstar Whisperer? Like, Carmelo's game changed immediately when Woodson took over. He seems to be tougher on his players than D'Antoni ever was, which you would think Carmelo wouldn't respond to ... but something's working. Did he have stretches like this in Atlanta when he seemed like the perfect coach? Well, if you think about it, 'Melo also played pretty well for George Karl and Jim Boeheim, neither of whom shy from confrontation. But as for Woody, one of the things I’ve always liked about him is that he’s remarkably consistent and self-assured. He has his way of doing things, and he expects you to do things the way he wants them done. I think players appreciate that he’s up-front and honest with them. In Atlanta, I think Woody was the perfect guy to get the Hawks from point A to B, but the question became "Could he get them past that point B?" And the Hawks decided he couldn’t. Is Woodson better at starting things than finishing things? Like, he helped build something good there but then seemed to lose guys. Will he lose the Knicks? because the sample size is so small. But I guess it’s a valid question, considering how things went in Atlanta. Then again, he had to start with a terrible team in Atlanta. In New York, he’s getting a playoff team to begin with, so perhaps he’s got a higher ceiling. Does he have any weird tendencies that come out in playoff games? Nah. He just cares about getting stops on defense. Also, it’s probably worth mentioning that, in Atlanta, he was always really good under pressure. He would come out each year and publicly set a goal for the team and himself (make the playoffs, win 50 games, make the second round, etc. ), and every year he would hit those marks. Seriously, has he always had that facial hair? As far as I know. Except for the eyebrows (briefly).